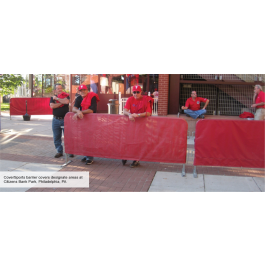 Enhance the look of your event or sports facility with a mesh cover for your barriers. Secured on the sides and bottom with velcro. Enhance the look of your event or sports facility with a mesh or vinyl cover for your barriers. These two-sided covers slip over the top of your crowd control barriers and are secured on the sides and bottom with velcro.